Dirty Rice or Rice Dressing? The Crop That Inspired a Cuisine. Although grown in Louisiana as early as 1718, rice did not become an important crop until after the Civil War. The great development of the state’s rice industry came as the result of the opening up of a prairie region in the southwestern (Cajun) part of the state where rice thrives in the water-logged, silt-rich soil, and the development of a system of irrigation that made the use of harvesting machinery similar to that used in the wheat fields of northwest Louisiana possible, greatly reducing the costs of production. Twenty-nine Louisiana parishes claim rice as a top crop, but one third of the state’s rice production comes from Jefferson Davis and Acadia parishes, with the latter’s city of Crowley claiming to be the capital and, hence, the home of the International Rice Festival, held every year on the third weekend in October. It is Louisiana’s largest and oldest agricultural festival. 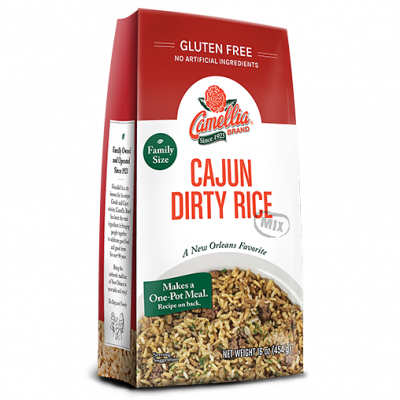 All over Acadiana, rice is an integral part of the menu, as one of the “3 pots” that make up a Cajun meal — meat, rice, and a vegetable. Hunting and trapping are as important to Cajun culture as rice farming. The two merge on the stove, where wild birds and game are traditional ingredients on the menu. 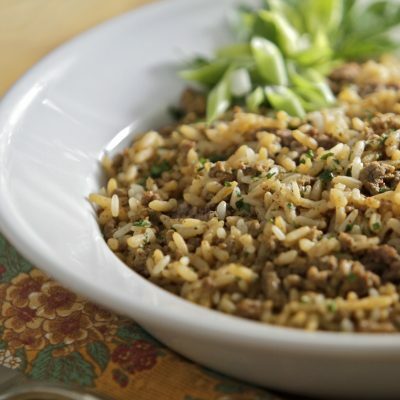 The main difference between Dirty Rice and Rice Dressing is that Rice Dressing is generally made with ground beef, pork, or venison, whereas Dirty Rice is made with organ meats such as livers, hearts, and giblets. 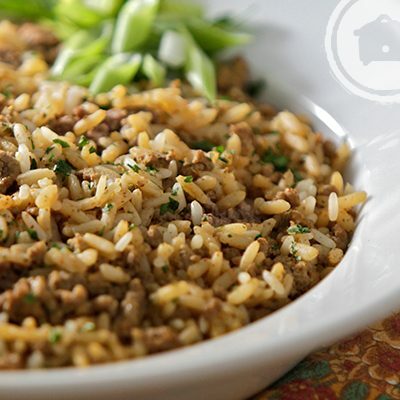 The dish takes its name from the “dirty” appearance the finely ground up meats give the rice. 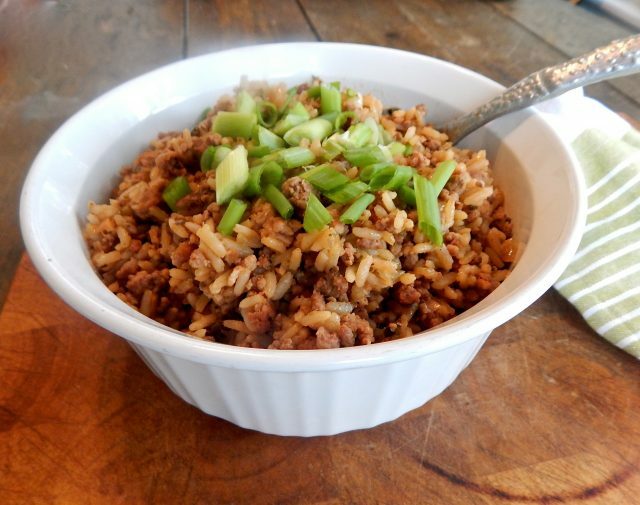 Essential ingredients in both Dirty Rice and Rice Dressing include the “holy trinity” — onion, celery, and green pepper — also garlic and some kind of fat, such as bacon drippings or lard. Beyond that, flavor and texture can vary greatly, depending on what’s available to add to the pot. Parsley and/or chopped green onions are common garnishes. A Simple Dish Worth Celebrating. Virtually every Cajun home proudly sports a rice cooker on the kitchen counter and no gathering — holiday, funeral, family reunion, or potluck dinner — is complete without at least one form of Dirty Rice or Rice Dressing. Usually several varieties are spread out on the sideboard, and Chef Donald Link recalls a family reunion that boasted eight distinct variations on the dish. These spicy, richly flavored, meaty mixtures are traditionally served as accompaniments to roast beef, pork, or game and some sort of vegetable, such as candied sweet potatoes, but is also a favorite way to stuff a Thanksgiving turkey in southern Louisiana. However you decide to prepare it, and whatever you grew up calling it, it will be sure to one of the dishes that people look forward to finding on your table. 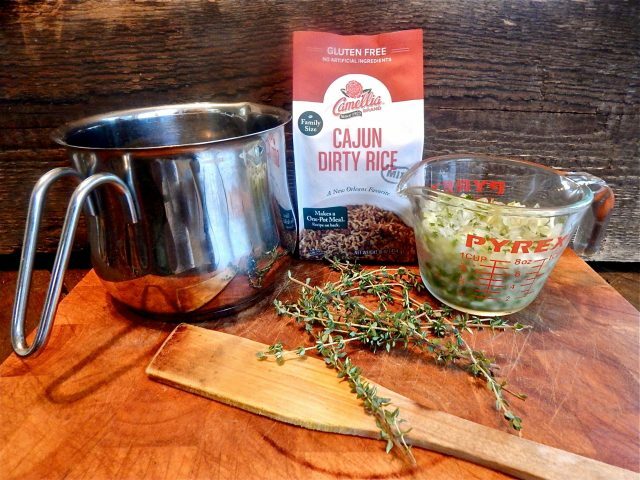 This is an easy way to customize the Cajun Dirty Rice Mix with just a few simple additions. Not only is it delicious dressing for your Thanksgiving turkey, the fact that it only takes 25 minutes means it works for busy weeknight dinners – with plenty of left-overs for the rest of the week! In a large heavy pot, brown ground beef and pork, breaking into very small pieces. Remove meat, and add flour to drippings, stirring constantly, until mixture is a deep brown roux. Return meat to pot. 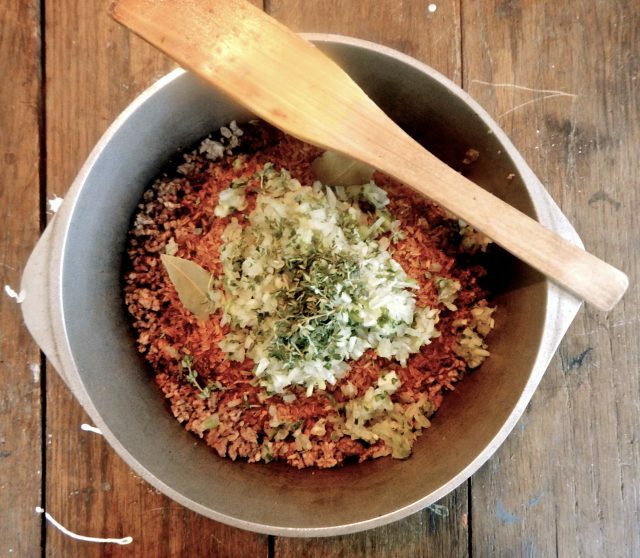 Add broth, Cajun Dirty Rice Mix, trinity, thyme, and bay leaves, stirring well to combine. Bring to boil, reduce heat, cover, and simmer for 25 minutes. Let stand for 5 minutes, stir, and top with chopped green onion garnish.